CMYUK’s UTACK material installed by Hollywood Monster creates the ‘wow factor’ for Morris & Company’s property launch with Caprice. Supermodel-turned-businesswoman Caprice at the Morris & Company launch, with graphics from Hollywood Monster, produced using CMYUK’s UTACK Multisurface wallpaperSpecialist wide format print and consumables provider CMYUK and client Hollywood Monster recently teamed up to create a huge promotional graphic. The purpose was to help national commercial property developer Morris & Company launch the latest phase of its Vanguard trade park site in Shrewsbury, UK. Robin East, CMYUK Director explained: “Morris & Company approached us to ask the best way of creating a stunning temporary graphic to cover the outside of their new units. Hollywood Monster printed the 5m x 17m graphic with its VUTEk GS3250 printer using CMYUK’s UTACK Multi-surface repositionable and removable textile material, on 25m x 1220mm wide strips that were then mounted directly onto the building’s cladding. 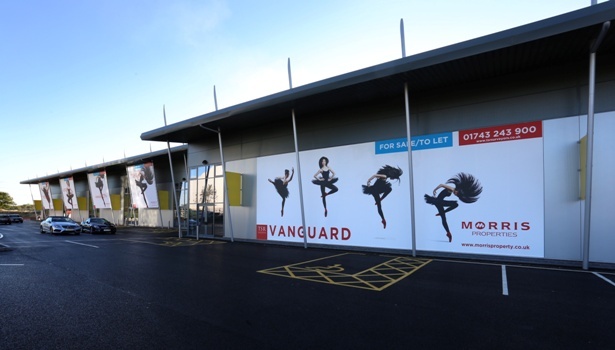 The promotional graphics created by Hollywood Monster using CMYUK’s UTACK Multisurface Wallpaper Kate Watkins from Morris & Company added: “Vanguard Trade Park in Shrewsbury is one of our most successful developments in the Midlands, attracting respected national brands and business start-ups. Our campaign had to support this established brand profile as well as promote the commercial messages of the new phase of trade counter units as being versatile and flexible spaces combined with contemporary and quality design. “We wanted to step change the traditional For Sale property boards and bring high impact visuals with edgy design to the development. The hoardings had to communicate the core values and USPs, as well as be visible from the main thoroughfare. This campaign needed the wow factor! He spoke to potential buyers about local opportunities at the launch event, which also featured Caprice Bourret talking about her move from supermodel to business leader. For more information on CMYUK and the UTACK media range, go to www.cmyuk.com. For more information on Hollywood Monster, go to www.hollywoodmonster.co.uk.